Mouse Without Borders is one of the many projects by Microsoft's Garage - a company wide program that encourages grass roots invention, tinkering, ideas and incubation of projects. 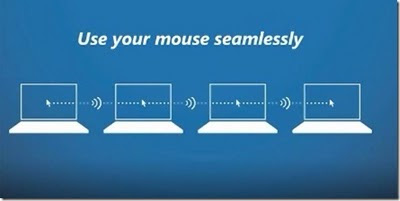 With Mouse Without Borders, not only can you drag your mouse between monitors, but you can even copy and paste text between computers and drag files from one to the other in the same local network, and all seem too easy to do so. Download Mouse Without Border (1.1mb).